New investment laws, rules and procedures in Myanmar have sparked widespread interest as they introduce reforms to boost investor confidence, increase efficiency, ease the doing of business and attract more foreign investments into the country. The Myanmar Investment Law 2016 (“MIL”) came into effect on 18 October 2016 and consolidates and replaces the previous Foreign Investment Law 2012 and the Citizens Investment Law 2013. The MIL, which provides the overall legal framework, was followed by the more detailed Myanmar Investment Rules 2017 (“Rules”) which came into effect on 30 March 2017 as well as two notifications: Notification 13/2017 dated 1 April 2017 (Classification of Promoted Sector) (“Notification 13”) and Notification 15/2017 dated 10 April 2017 (List of Restricted Investment Activities) (“Notification 15”). Together, these represent the body of the current Myanmar foreign investment laws. The MIL, from its start date, applies to existing or new investments in Myanmar except for matters coming under the old Foreign Investment Law 2012 such as investment disputes or prior permit investments previously suspended from business operations before the start date or investment projects suspended by governmental measures under general and national security exemptions. With the merging and consolidation of the Foreign Investment Law 2012 and the Citizens Investment Law 2013 into the new MIL, the Government will now treat foreign and local investment projects equally in terms of expansion, management, operation and sale of direct investments. There are now two types of processes to obtain approval from the Myanmar Investment Commission (“MIC”), that is, the permit application process and the endorsement application process. The endorsement process speeds up the approval process for investments in non-restricted business activities (that is, activities that do not require a permit). Endorsements entitle investors to enjoy land use rights and other exemptions and reliefs such as customs free duty and income tax exemptions. According to Notification 13, if the business is in one of the “Promoted Sectors”, it may be possible to be a 100% foreign-owned business qualifying for endorsement by MIC or the relevant state or regional committee. Investors can better understand what activities qualify for 100% foreign-owned treatment by reading Notification 13 together with Notification 15 (discussed below). Endorsement applications can be submitted to either the MIC or the relevant state or regional committee. Prohibited investment activities include those which may (a) bring or cause hazardous or poisonous wastes into Myanmar, (b) bring technologies, medicines, flora and fauna and instruments which are still being tested abroad, except for investments made for research and development, (c) affect Myanmar’s ethnic groups’ traditional culture and customs, (d) adversely affect the public, (e) cause an enormous impact on the natural environment and ecosystem, and (f) manufacture goods or provide services that are prohibited by law. investment businesses only allowed in the form of a joint venture with a Myanmar citizen or citizen owned entity (a Myanmar local minimum direct shareholding interest of at least 20% however is required with approval from the relevant Ministries). investment businesses requiring approval of the relevant ministries. For investors who are uncertain as to what type of investment they can engage in, MIC can pre-screen their investment applications for a nominal fee. The project’s nature and all material information will need to be fully disclosed to allow MIC to assess what type of application needs to be made. MIC can offer non-binding guidance within 10 working days from the date of application. The zone in which the investment takes place: MIC may with the approval of the Government grant income tax exemptions in Zone (1) (less developed regions) for 7 years; in Zone (2) (moderate developed regions) for 5 years; in Zone (3) (adequate developed regions) for 3 years. Other factors such as the value of investment (must exceed USD300,000); whether the investment creates new employment opportunities in Myanmar and develops a skilled labour force, brings new or enhanced technology or business skills, leads to market competition, greater efficiency or productivity, or provision of enhanced infrastructure or services in Myanmar. Applications for tax incentives may be submitted together with or subsequent to a proposal for a permit or application for endorsement, and must specify the precise tax incentives applied for. Investors who obtain permits or endorsements are entitled to obtain long-term lease rights (on land or building) for up to an initial 50 year period and two consecutive 10-year extensions. Such investors may apply to the MIC for a land rights authorization, which will be assessed by the MIC or relevant state or regional committee. Foreign investors may transfer abroad funds relating to investments made under the MIL. Any transfers of funds shall be allowed only after paying all tax obligations imposed on such amount in accordance with the relevant tax laws. Foreign experts with legal work permits may make remittances abroad without any further deduction from the amount paid under income tax law. Transfers of loan proceeds or taking a loan is subject to the approval of the Central Bank of Myanmar. The approval of MIC is also required in relation to the transfer of proceeds from a total or partial sale or liquidation, payments resulting from any settlement of investment disputes, compensation under investment or expropriation, or where the investor has any outstanding tax obligations, or any contingent or disputed obligations within Myanmar. Investors holding a permit or endorsement are required to take out relevant insurance based on the following types of insurance: property and business interruption insurance; engineering insurance; professional liability insurance; professional accident insurance; marine insurance; and workmen compensation insurance. Under the Rules, any permit issued to an investor under the previous investment law shall remain effective until the permit expires. If the investor wishes to take advantage of any additional or discretionary incentives available under the new law, the investor may apply to enjoy the new benefits. An investor who has commenced operation prior to the Rules coming into effect and who intends to change its original investment activities will have to apply for a permit if such change requires a proposal to be submitted. 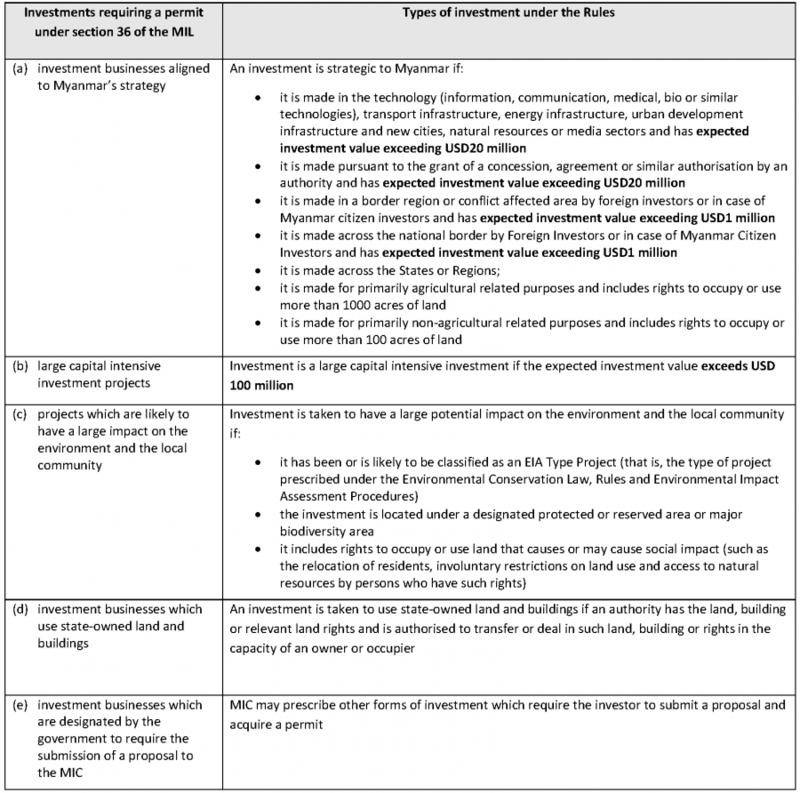 However, for ownership structural changes (Myanmar local investment to foreign investment or vice versa) a proposal or endorsement application is not required to be submitted to MIC. If you have any questions or require any additional information, please contact Sam Britton or Thit Thit Kyaw or the ZICO Law partner you usually deal with.